The ultimate real life adrenaline fueled battle experience! Plan your mission and use the battlefield to your advantage. Crank up the excitement of your next event and shoot your mates. Birthdays, Hen’s and Buck’s, Team Building Days, Corporate Functions, School Groups and more. Tailor your ultimate paintball experience. Explore our battlefields and plan your strategy! All the latest news from D*A*S*H.
Get off the couch and into the war zone! 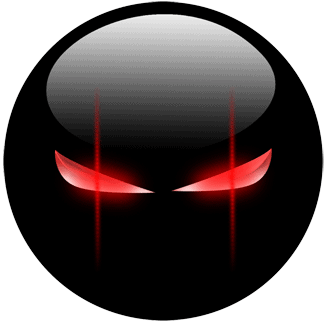 Strategise with your mates to complete objectives and dominate the arena. Explore our purpose designed paintball fields and immerse yourself in real live combat situations. Don’t miss out on your opportunity to share in the glory and ultimate victory for your team! 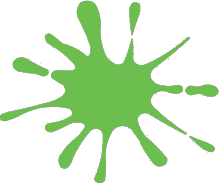 Dash Paintball Perth – The Best Paintballing Experience Around! 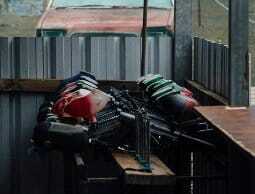 Paintballing in Perth does not get any better than at Dash Paintball. We offer a break from mundane reality and put you and your friends in a fun and exhilarating setting. With 140 acres of naturally bushy land, and seven themed battlefields, there will be a ton of different ways and opportunities to play paintball. You can play freely and let everyone go on their own hunt, or strategise with your teammates for maximum efficiency in taking out opponents. Your imagination is your limit, when you are out on the field. Even with our basic packs, you will enjoy paintball to its fullest. We provide the safety gear so you would not have to buy or bring your own. For the most extreme of paintball experience, however, we suggest our Universal Soldier Pack. Anyone who gets it receives a thousand rounds of paintballs, weapon upgrades and access to different equipment and masks. If you and your friends are all about the thrill of the paintball manhunt, this is for you. As for our battlefields, each type caters to different skill levels. 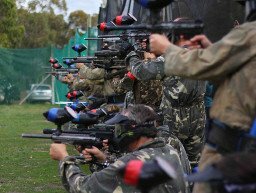 You will find few paintball centres in Perth, WA that offer this kind of variety. The Pines Field is our beginner’s haunt: the obstructions are easy to decipher and the battles are usually straightforward. 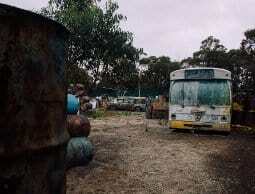 The Bus Field is our thematic beginner-tier field, which derives inspiration from Mad Max. The apocalyptic setting and ravaged buses make for a fun, movie-like experience. Seasoned players will take to the missile and aeroplane fields, which are more challenging, with a different gameplay. Strategising and skill are critical if you want your team to win. For the best, true-to-life battle experience, the Urban Village field is for you. This is where you can perform actual close-quarters combat and approach it like real soldiers. It is “kill or be killed,” but not literally! Similarly, if all-out action is what you and your friends want, go to Speedball field, where the course is all about flanking and dominating your opponent. We want everyone who comes to our grounds to enjoy paintballing. This is why our staff members conduct checks and lectures for our customers to understand the rules of the game and the boundaries of each player. As real as it gets in our battlefields, the goal is for you to enjoy something different. Your adrenaline will be pumping, but be cautious so you can help your team win. Very few activities take you to the extreme and paintball is one of them. Let Perth’s Dash Paintball cater to your radical side! Get in touch with us today! Our mission, while you are busy completing yours, is to keep you and your mates safe. Full safety gear including, overalls and mask are provided to each player along with a full briefing on the paintball guns and dedicated referees in each battle zone. *Note: Shoot the referees at your own risk. We did warn you!